Hail, as you might already know, is a kind of solid precipitation that falls as lumps of ice. 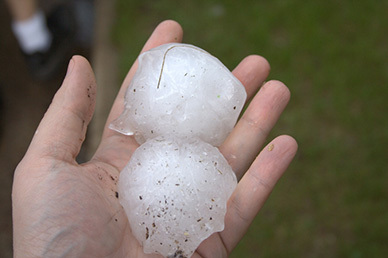 Some thunderstorms bring hail particles that are just a few millimeters in diameter, but stronger storms can cause ice balls as big as 6 inches in diameter to fall. As you can imagine, hailstorms are very destructive and can cause immense damage on properties. Hail particles start out as liquid rain droplets. When these droplets are carried by strong updrafts or upward-moving winds to a level in the atmosphere where the temperature is freezing, the water droplets begin to solidify into little ice balls. This process of being carried by updrafts can repeat several times, making the ice clumps bigger and bigger until there is a chance for them to fall to the ground. At Superior Remodelers, we know for a fact how many headaches hailstorms can bring. When such a brutal weather condition damages your home, the costs can prove to be very significant. That’s why we’re always ready to help you get back on your feet. Expert assessment of hail damage – Determining how much a recent hailstorm has damaged your property is not always easy to do. 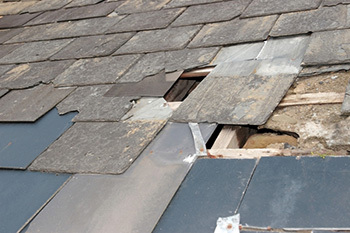 For instance, the hail could have caused damage on your roof, but since this part of the house is not normally accessible, the problem could go unnoticed. A seemingly minor problem, like broken roof shingles, can lead to bigger problems, such as leaks, in the future. Trust your professionals at Superior Remodelers to give your property a comprehensive assessment of the damage so that you can take the necessary corrective action. Professional hail damage restoration – If you are concerned about your safety and are not too keen on inspecting a hail-damaged roof yourself, call us today, and we’ll be more than happy to lend you a hand. As one of the leading home improvement companies in Newtown and surrounding areas in Connecticut, Superior Remodelers is composed of experienced and highly trained remodeling professionals who can perform the risky job of climbing on your roof so that you won’t have to do it yourself. We are experts in home construction and reconstruction, adeptly fixing all sorts of residential property damage caused by hailstorms and other inclement weather patterns. If your property has suffered from hail damage, don’t despair. Call Superior Remodelers immediately, and we’ll help you return your home or business property back to its pre-loss condition. You can reach us through our phone number, 888-330-8148, or you may also send us a message through our contact page. 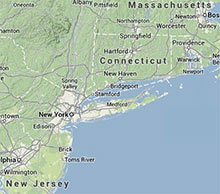 Our service area includes the town of Newtown in Connecticut, and surrounding areas in New York, New Jersey, Massachusetts, and Rhode Island.